Let's start with what I collect. For those of you who read this blog on a regular basis, you will or have already noticed, that I have a few diffrent collections going. I collect New York Yankees, New York Jets, Spider-Man, Batman, bobblehead dolls, KISS, The Beatles, The Monkees, autographs, Back To The Future, Roddy Piper, Stone Cold Steve Austin and anything else I find intresting. I am pack rat and when I see something I like, I buy it. To me, picking just one white whale or holy grail was next to impossible since I want to add so many items to these growing collections. So, what I decided to do was pick the one item from each collection that I am working on that I would call my "holy grail" of that particular collection. I also went with realistic white whales, meaning whales I can realisticly snag. Sure, I would love to add Spider-Man # 1 or a cowl used by Adam West during filming of the Batman tv show. But really, am I going to find a Mickey Mantle game used jersey at a flea market? No way. Will I be able to afford a 8 x10 signed by all four members of The Beatles? Not anytime soon. My plan to win the lotto will come to fruition soon, but until then, I will go cheap and choose the whales I can land without declaring bankruptcy. 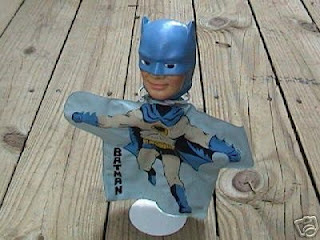 This 1966 Batman puppet was made by Ideal during the height of Batmania, caused by the Live Action Batman tv show. These puppets were either sold in a box or a plastic bag. Ideal also made Robin and The Joker. Since I only collect Batman for the time being, I would consider this to be the holy grail for my Batman collection. I have either lost a bid on ebay or found it at flea markets/toy shows in less than desirable condition at outragous prices. This is one piece of Batman merchandise I know I can add to my collection without breaking the bank. I just need to be patient. 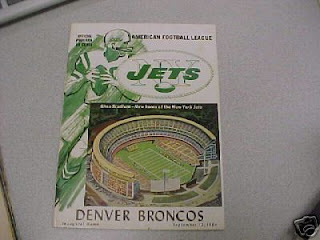 Another item I would love to own one day is a program from the very first game the New York Jets played at Shea Stadium. For the first 4 years, the Jets (known as the Titans at this point) played their home games at the old Polo Grounds in Manhattan. They played to very little fanfare as the Titans drew flies dispite fielding competitve teams. The team became the Jets in 1963, playing out it's last year in the Polo Grounds before moving to a brand spanking new Shea Stadium in 1964. On September 12th, the Jets played the Denver Broncos in their first game at Shea, beating Denver 30-6 before a crowd of 45,665 fans. I have never seen a copy of the program in person, but have bid on a few on ebay usually losing in the 50-65.00 range. Always looking to score sweet swag on the cheap, I always try to win this in the 30 dollar range. I'm usually winning until the last half hour. I guess next time, I'll just have to bid the the 50.00 range. I know, I know. I'm a skinflint. Ok. A-I love KISS B-I love Megos. When these two teamed up in the 70's, I cruelly learned a new word to add to my young vocabulary: Drool. Back in the 70's, KISS was everywhere. Lunchboxes, radios, tshirts, belt buckles. Gene Simmons and Paul Stanley never met a buck they didn't like and would sell their likeness to anything and anyone willing to pay. Fast forward to today and nothing's changed. 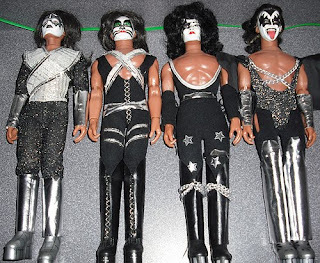 Gene and Paul still sell out the Kiss name and likeness to make a buck and I still want these action figures. Yes, they are made on bodies that the KISS members only dreamed they had. But that doesn't take away from how cool they look. The make up is pretty dead on as well as the costumes. The faces...wellllll. Gene is probably the best looking figure. Funny thing, the Ace figure looks like Tommy Thayer now. To own this set is pricey, but can be done. Here's another pricey piece I'd love to own and it's a holy grail for both the Yankee and bobblehead collections. 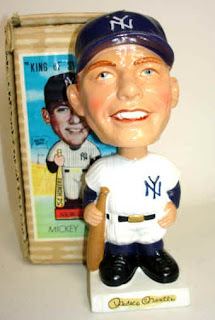 This bobblehead was made in 1961-1963. There were 2 versions of the Mantle: The square base pictured above and one that had a round base. Mantle was released with Roger Maris, Willie Mays and the very rare Roberto Clemente. There was also a mini version of this bobble that is very pricey. This bobble, I have seen on ebay for around 150-200.00. Pricey, yet affordable. Here's something I have wanted for quite sometime. 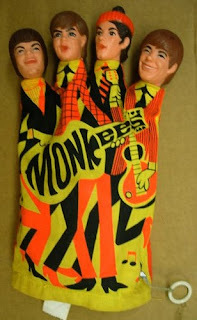 A Monkees puppet made by Mattel in 1966. The puppet has the heads of Davy Jones, Peter Tork, Mickey Dolenz and Mike Nesmith on four fingers and had a draw string that would "say" 10 diffrent recorded comedy bits voiced by the band. Finding a puppet that actually has a working voice box is the trick, because any auction I have seen or in person at a flea market, the puppet voice is silenced. Honestly, as much as I'd love to find one that works so I can sit on the floor, pull the draw string and giggle like a ten year, chances are slim. I would be happy to have a non working one to display with the rest of my Monkees collectables. I can usually find this anywhere between 60-80.00, but with the recent passing of Davy Jones, I'm betting the value went up a bit. Yes, I know wrestling is fake, but I am still a huge fan. 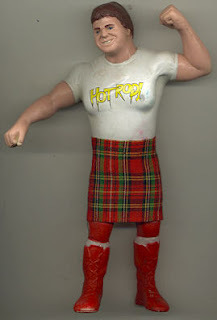 My all time favorite wrestler is "Rowdy" Roddy Piper. I was a huge fan back when he was causing havock in the old WWF, hosting the notorious "Piper's Pit". When LJN came out with these rubber wrestling figures in 1984, I got 2 for Christmas: Hulk Hogan and of course, Roddy Piper. First thing I did was take the WWF Title off Hogan and put it on Piper. I had that figure for years and forgot what happened to it. I've been looking for another for a while, but it has to have the kilt. I have seen way too many without it and, to me, no Piper figure is complete without it. 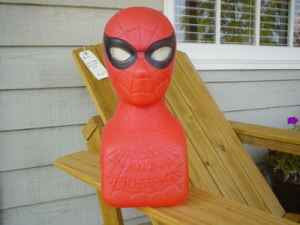 Last and not least, we have this 1970's Spider-Man bank which has driven me to the brink of insanity. Why? Because 3 times I have bought this bank and 3 times something bad has happened to it. The first time, it got crushed in boxes during a move. The second time, it got decapitated. Don't ask how. It just happened and it wasn't pretty. The third time crushed again. Those happened because I didn't have a place for it and tried to store it in places were it met fates worse than death. Now that I have my Spidey Shelves, this hunk of plastic would look awesome sticking out of the sea of Spidey toys. I just have to win one. I keep getting out bid on it. It's almost like a Spidey bank fairy is preventing me from winning one because of what happened to the others. Stop me? I don't think so. It will be mine. Oh yes, it will be mine. There were 2 others I wanted to add, like the Beatles Flip Your Wig game or the 1970's Godzilla toy I used to have that had the firing fist I used to aim at my sister and conk her on the head. But even I had to have a limit. With all stuff I want, I better have a huge man cave to put it all in. Which I will because that fool proof plan to win the lottery will help pay for all this stuff and I will live an exsitance worthy of Comic Book Guy from the Simpsons. Except better looking. But just as geeky and damn proud of it. I'd love to get something KISS related for my collection, but every time I come across anything, it's just too pricey. Those figures are awesome though, and would be the first thing on my list. Outstanding picks! Lots of great stuff. I remember going to my older cousin's house and he had KISS everything in his room including the Mego dolls. That room was like the coolest place for me between the KISS stuff and Atari 2600 he had hooked up and i would spend hours in there playing games and listening to music it was fun. Thanks. I love KISS, but all my KISS stuff is the newer stuff. I don't have any vintage KISS. I hope to change that some time soon.